The modern Caucasian evolved answering roughly two divisions of duties, which has resulted in two basic protection-aggression levels within the breed. The Caucasians that stayed in the mountains guarding the flocks of sheep or protecting the family tended to be of a lower aggression level. The dogs that were bred by the Soviet Military for police dogs were bred for a higher aggression level, but also selected for trainability and controllability. Later these differences were kept intact: some dogs were bred for fighting or protecting warehouses, and some dogs were bred to protect the family children. Thus, there are two protection levels predominant in the breed, that can answer the needs of any family: for a family that is "at risk" a Military-style, or high-aggression dog would perhaps be better. 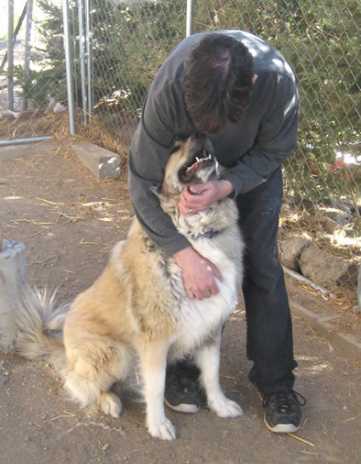 For families not at risk, the Mountain-style, or lower aggression dog might be preferred. In either case, the protection response of the properly bred Caucasian will be active, versus passive. That is, the dog will attack a perceived threat, rather than passively protect by standing ground and barking. The Active Defensive Reaction, or ADR, can easily be recognized, even by the novice eye. We've had visitors, who after only a few minutes of viewing the dogs, correctly point out the Military-style dogs in our group. ADR can be thought of as the "trigger response" of the dog -- a higher ADR has a quicker "trigger", the lower ADR has a slower "trigger". Experienced and knowledgeable breeders of Caucasians can distinguish between a high-ADR (quick trigger) pup and a lower-ADR (slower trigger) pup by 5-8 weeks of age. Likewise, the experienced eye can determine at this early age if a pup has a high Sociability rating (genuinely likes people, if properly introduced) or a low Sociability rating (only likes the immediate family, or possibly, only one individual). There are different protection needs that these different levels of protection are suited for -- reading the page entitled Temperament Evaluation will help you understand the various traits in evidence in the breed. Our book will help you decide which level of protection aggression and sociability is right for you. To order our book, see the section on Contact & Book. Any combination of ADR and Sociability is possible, but it doesn't "just happen". Breeders must know their stock and understand the genetics of temperament inheritance in order to achieve these particular combinations of traits. In short, these specific traits and characteristics that distinguish these levels of protection must be identified and selected for by the breeder, else they will be lost. The Rottweilers, Dobermans, and Shepherds are three breeds suffering from a significant reduction in protection instinct, because most breeders are not selecting for these traits. The Golden Rule of Dog Breeding is this: If the trait is Good, and you don't select FOR it, you will lose it. If the trait is Bad, and you don't select AWAY from it, you will get it. This is the reason many popular breeds are beset with temperament and genetic health problems today. Unfortunately, given the poor breeding practices surrounding Caucasians today, this is what is in store for this lovely breed, too. A proliferation of novice breeders, both the well-meaning and the greedy, are decimating both the temperament and the genetic health of the Caucasian in America. Add to that the fact that a large number of mix-breeds (carrying purebred Caucasian papers) are being utilized in breeding programs throughout the U.S. and Canada, and the prospects for the breed on this continent are very poor. Already we have been barraged with questions and pleas for help from those owners who purchased from a disreputable or unknowledgeable breeder. One woman called us crying: she had a 7-month-old Caucasian pup that had bitten three people already, and she had a 1-month-old baby. For her and others like her, there is little we can do. A small breed with a poor temperament is hard enough to deal with; a large, strong, naturally aggressive dog with an unstable temperament should be destroyed, before serious human injury results. There is no training that can make up for a bad temperament, and no better way to ensure a good temperament than to select an ethical, knowledgeable breeder.